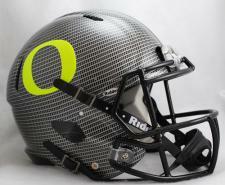 Oregon Ducks Carbon Fiber Speed Helmet by Riddell | Sports Memorabilia! The Oregon Ducks Carbon Fiber Speed Helmet is the authentic helmet as seen on the field. These new HydroFX helmets feature complete helmet-wrap graphics on a Speed shell with with offical team decals and black chinstrap. Riddell’s Revolution Speed helmet has taken the football world by storm. With a distinctive, aggressive shell design, the Speed helmet is being adopted by premier athletes at a furious pace. Large size shell, special order facemask worn by most of the star players who choose to wear the Speed, internal padding reflective of the “Speed Classic” design, 4-pt. chinstrap. Approx. 10” tall.